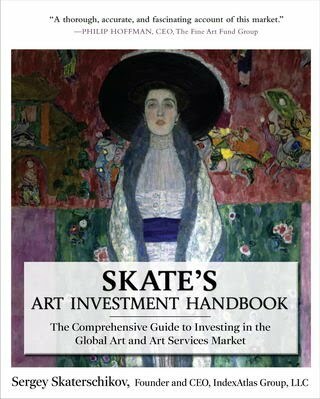 Sergey Skaterschikov has released the new edition of Skate’s Art Investment Handbook, The Comprehensive Guide to Investing in the Global Art and Art Services Market. 2008 was a record year for art sales. Inflated prices set the bar for record prices and sales. The new edition of Skate’s Art Investment Handbook addresses market behaviours of the auction houses, art, and artists. Especially relating the pre-boom period up until the height of the market in 2008, and the retrospective recovery period we have seen in the last year. It is understood that art should not be bought as a trading stock, and the return on investment is not as clear as with the stock market. Skate’s must have guide, outlines all the foundational elements of the financial world as it relates to the art market ensuring that any collector can maximize the potential of a developing collection. Critics, journalists and art market analysts discuss their individual approaches to decoding the exceptional social and economic landscape of the art world. What are the challenges involved in reporting on an unregulated market? What kinds of economic indices work – and which don’t – in analyzing this market? What forms of study or reporting – anthropology? Sociology? The “New New” journalism? – are most effective in covering the art world and making sense of its byways? With Marion Maneker (Art Market Monitor), Sergey Skaterschikov (Skate’s Art Market Research), Sarah Thornton (author, Seven Days in the Art World, (W.W. Norton, 2008), Judd Tully (Editor at Large, Art + Auction), and Edward Winkleman (Winkleman Gallery, NY). Moderated by Sarah Douglas (Senior Correspondent, Art+Auction and Modern Painters magazines).